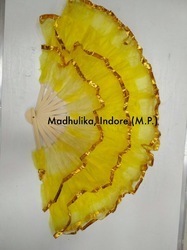 Being the leading manufacturer and supplier, we are offering a wide range of sandalwood fans This range is reckoned amongst the clients for its exclusive designs that are widely used in decor of the house. We have exclusive item in copper. They are copy of old style hand fan's. This is hand fen made by Palm leaf . Its totally hand made and organic handicrafts products. These Hand Fans are made up by the poor Indian Lady artisans and these are purely handicrafts accept its handle. 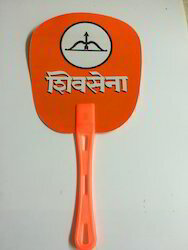 In before last decades, these are very popular Hand fans in Indian villages. It also shows the craftmenship of that particular lady and almost used in Indian villages in summer season. It is a very time consuming item. Products are a way of khas roots. Products are cast in different types by the artisan. Khas products are suitable for summer. It seem to smell, when the water splatter. This is a special wing of khas. Just sprinkle a little water on it and let take the cold drafts. Chinese Japanese hand fans are available from 6 inches to 48 inches. Our organization is indulged in offering Traditional Hand Pakhi to our clients. These are available with the many patterns like phulkari design, sitara pakhi, velvet based statara worked design, and available in all colure to give your home a traditional feel of punjabi style and cultured, showcase these on your wall and give a amazing and cultured look.